"A child who does not have adequate sensory-motor modulation (praxis) might be thirsty and know he wants something to drink, but won't know how to make it happen. His being thirsty and unable to satisfy his thirst may result in a tantrum. Praxis allows our intentions to become purposeful. Children with poor praxis may make slow developmental progress. It may be that one of the earliest signs of ASD - not pointing for desired objects - is due to difficulty with praxis." by Ricki G. Robinson, M.D., M.P.H. LINKS - DVDs for YOU! "Keep your heart with all diligence. For out of it spring the issues of life." The Autism Speaks Walk was AWWWWESOME!!!! My boys were able to play and jump and jump and jump jump jump! There were several GIGANTIC bouncers. 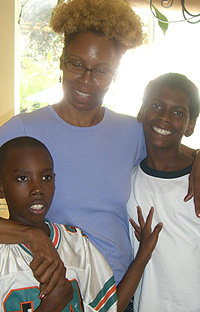 Carter, 15 and Bakary, 13 are spectrum teens who still need extreme sensory input. They were the biggest kids in the bouncers ... and probably will be for a very long time. (I need to own a bouncer company.) It was our first time on this walk. We've walked several times for Pancreatic Cancer. We don't usually finish, but we have a good time. My Co-works at Fox 1440 contributed, big time. How humbling it felt to know how much people around us truly cared. We hung out with the Palomar family. Mom, Evelin is my new friend. She and her husband, Ernesto, have two boys with developmental delays. Her youngest, Jeremy (not diagnosed with ASD), is like my oldest and my youngest is like her oldest, Isiah. The Palomar boys had their Grandparents, Aunts, Uncles, Cousins and friends from both sides of the family walking with and often carrying them that day. 24 in all, wearing beautiful "Isiah's World" shirts they made, together, to show their love and support. Autism Speaks Walk Coordinator, Sarah Belcher told me, "We had around 30,000 people attend the event. To date we have raised a little over $1,793,000. That money gets split up between research, advocacy, family services and awareness." Bravo Autism Speaks! At the last two conferences I attended - The Special Needs Network's "Advocate Summit" and The Help Group's "Advance LA: Supporting Teens & Young Adults in their Transition to Independence" I did something I love to do; I perused the books. I was so fascinated with the massive selection on Autism, Asperger's, ADHD and the like, I beamed with joy. These were books for MEEEEE!!!! 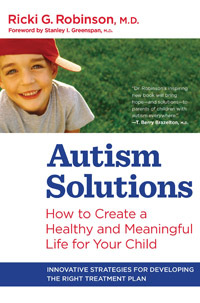 Books on all aspects of the autism spectrum were there for the picking. While at conferences, I've actually learned to make myself get at least one book that will enrich my knowledge of this thing called autism. I can afford 1. And every now and then I spring for the thick, big one that I really really want. And then I look down the road for a vacation on which to read it. In the meantime, I skip through it and gobble up all the essential facts that made me buy it in the first place. It's amazing how much, over a period of time, I've learned by just reading up on issues that concern me. At the "Advance LA" conference, I introduced myself to Hod & Laraine Gray. It occurred to me that these were the same people I bought a book from at the "Advocate Summit" and here they were again. I discovered they embody a passion like no one else. They travel the country, year round, making unique books available at unique conferences for families and individuals facing unique challenges with disabilities. 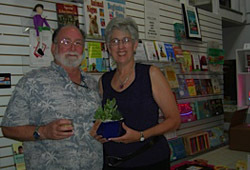 The "Special Needs Project: America's Disability Bookstore" is base out of Santa Barbara, CA. The books are also available online at SpecialNeedsProject.com. Always looking for what folks like us want to know, Laraine asked me if there were any books I knew of that other parents would be interested in. I found that refreshing. (I didn't have an answer because I was already overwhelmed by all the titles I had ingested minutes prior... and I still don't know of any ,but please, if you have suggestions contact Laraine and tell her I encouraged you ;-) An Elementary School Teacher for 30 years Mrs. Grey likes to help people. She finds joy in empowering parents, medical professionals as well as educators so that they can better serve the disability population. "I'm still doing show & tell" she says. She told me how her husband founded America's Disability Bookstore while showing me his new found love for different IPad features. He was creating signs in neon on the IPad and placing them about the book store. She also shared a bit of insight on a few of the people featured in the book I was buying, "Autism All-Stars." She's met many of our industry experts and celebrities.... How cool! Laraine also told me that (No names here) one of the "Autism All-Stars" was determined to de-throne Temple Grandin as the "go-to" personality for autism. I was so glad I knew this, because I immediately started praying for this person. I said, "We don't have to put someone down to rise to the top. God has room at the top for everyone. We are all His Kings and Queens." Hod and his first wife ,Lynn Jehlee, had a daughter born with Cerebral Palsy. An only child, Dolly loved for her parents to read to her. And they did - a lot! She loved classical music also. Haydn was her favorite composer. Dolly didn't have much hand control, so Hod fixed a radio so that she could swat it and change the station. Hod says "it's a shame she's not alive to utilize the computers of today." She communicated via computers back then. The computers today "would have made her life better." She was a leader and a very positive person. When ever Hod hears "Dance of the blessed Spirits" from the opera "Orpheus and Eurydice" by C.W. Gluck he says he knows Dolly is communicating with him. Make sure to have a listen (link on the left - skip the ad). It happened the first time he heard the piece and it happens every time. Hod Grey's desire to provide books for a select demographic sprang from his love for his little Princess, Dolly. They lived in Berkley. Grey's Book Company was the store they owned when Hod established a catalog of books on disabilities. It just thrills me to imagine how happy parents must have been to find such a valuable resource. Partly because the public schools left much to be desired for parents raising a special needs child and partly because of his thirst to find ways to expand Dolly's world, the seeds of America's Disability Bookstore were planted, watered and nurtured. Through Oakland's Children's Hospital Hod and Lynn found one of the leading experts in Cerebral Palsy, Neurologist Gabriella E. Molnar, M.D. an authority on pediatric rehabilitation and the Author of several books. Hod says that "when people say there isn't much you can do, just learn to cope - the notion that any condition is incapable of change is dangerous. We are learning all the time." Children's Hospital gave this family sound and hopeful direction. In 1989 "Special Needs Project: America's Disability Bookstore" was founded. Since that time, the print, mail order, catalog has vanished and become an online catalog providing people like you and me with sound and hopeful direction. The CEC - Council for Exceptional Children asked Hod Grey to sponsor a book award for children's books for disabilities. It is called, the Dolly Grey Book Award. Laraine Grey has noticed that parents who build such expertise while caring for their special needs children go on to develop careers for themselves to make a difference. Dolly's Mother, Lynn, went on to work as a Paralegal and Parent Advocate for DREDF - The Disability Rights Education Defense Fund. Now she's a Nurse Practitioner working in the field of neurological disorders. Perhaps you know Hod or Laraine or Lynn. Perhaps you'll meet them one day. Remember to thank them for what they do. Remember to let them know how blessed we are that they chose to serve our wildly growing special needs community. Let them know that they are an inspiration beyond what we might imagine.